Here’s a photo of my condo building – it’s the tall one, second from the front. All of the red buildings are wedding dress shops1. A few weeks ago, my friend Kim came over for dinner. On her way in, she saw a realtor who was waiting for a client who had an appointment to look at a condo that was up for sale in my building. She came in and said, “Your exact apartment is for sale on the 10th floor. Why aren’t you buying it? ?” And then she told me the price. And the price seemed too good. My first thought was “omg, what’s wrong with my building? Why is this apartment so cheap?” I should note here that “cheap” is relative. Housing prices in Greater Vancouver are insane and though New Westminster, where I live, is cheaper than Vancouver (or even Burnaby), this price seemed quite good, even for New West. So I went and looked at it and though it was a little weird looking at an apartment that has the exact same layout as mine, there were a few things that made it nicer – better appliances2 and laminate floors3, for example – so I wasn’t looking at an *exact* copy of my place – but pretty close! And then I called a realtor to have her look into the building for me and I talked to a friend of a friend who is on strata4 in the building and everything checked out. And I crunched some numbers and found that mortgage, strata fees, and property tax will be significantly less than my rent. And I realized that I really like my apartment, I like my building, I like New West. And I don’t have plans on going anywhere else. So I put in an offer. And after some negotiation and some due diligence5 ,6 I am now about to be the proud owner of my very own condo – closing on June 23, possession on June 24. Ok, technically I am going to be the proud owner of 25% of a condo, with the mortgage company7 owning the other 75% of the place but allowing me to live there in exchange for me paying them off for the next 22.27 years8 ). In related news, Watson & Crick are over the moon with all the cardboard boxes that I’ve been bringing home. 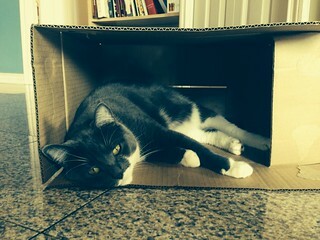 Moving is a kitty paradise. Until the actual day of moving, when they’ll be trapped in a room as movers make a bunch of noise in the other rooms. I suspect that will drive them crazy. 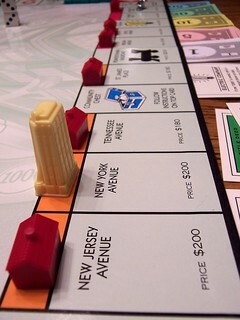 Monopoly board posted by Andrea Allan on Flickr. 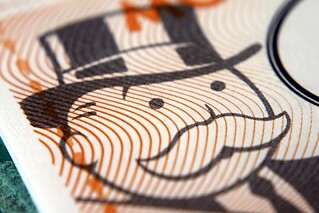 Monopoly banker dude posted by Dave Rutt on Flickr. Dr. Crick in a box is my own photo. 6 Responses to I Bought A Condo! Kudos to you on your new place. Nice that your Mom and Aunt are coming for a visit….just in time to help you pack. @Aunt Lynn – Yeah, I’m sure if those two had their way, my entire apartment would be packed up before they left, even though I still will have almost a month before I move!